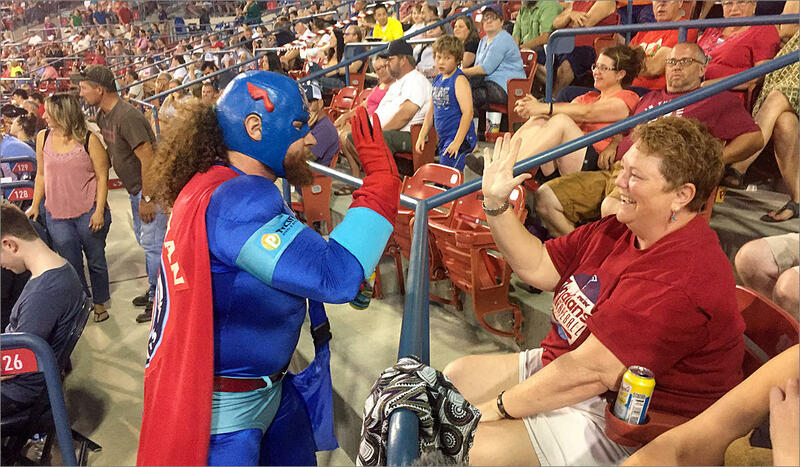 Recycle Man aims to use positiv reinforcement to encourage fans at Spokane Indians games to recycle. Ribby the Redband trout is Spokane Indians' newest mascot. For decades, Smokey Bear has been the poster-mammal for keeping forests clean and safe from disaster, but there are other mascots who aim to serve up a lesson in environmental consciousness. With the score tied 8-8 in the top of the seventh inning of a minor league baseball game between the Spokane Indians and Eugene Oregon’s Emeralds, a giant fish stands waiting. Behind a gate, at the back of the stadium, in the corner, behind left field. The Spokane Indians’ newest mascot, Ribby, doesn’t talk. He’s here to raise awareness about his species: a small Northwest fish that, over the years, has declined in number in the nearby Spokane River. During this Seventh Inning Stretch, like a blue and red streak, Ribby runs toward home plate to rally the fans. Fans don a red and blue paper crown with a giant, leaping, fish in the middle of it. 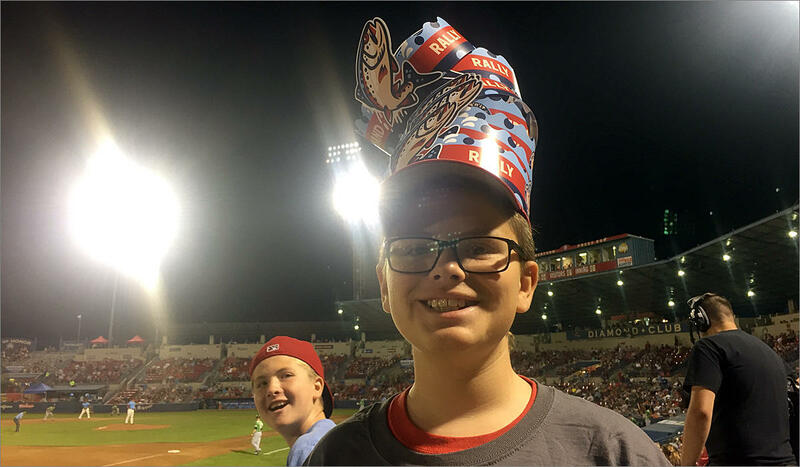 Ian Szymanski has at least eight—maybe more—of those crowns stacked high on his head. “I think I’m his biggest fan now,” he said. But does Ribby’s superfan know much about the Redband trout? “Um… no, not really,” Szymanski said with a laugh. Sparking interest in the Redband trout was exactly what the team’s Senior Vice President Otto Klein—an enthusiastic fly fisherman—hoped for when he came up with the idea. But he realized before he could introduce the new mascot, he had to do one last thing. … and why the fish and its habitat are worth keeping round. Ribby isn’t the only mascot in Spokane with a green message. When fans see Recycle Man, they call for him and he comes running. He grabs an empty beer can from local Cherie Letz and smashes it against his forehead. Letz already knew about Recycle Man—and that he would come to get her empties. But would she have recycled her can if Recycle Man wasn’t here? And off goes the superhero, a blue streak, up three flights of stairs, red cape flapping, on the hunt for another empty. Recycle Man doles out high fives, shakes hands, whoops and hollers when fans recycle. A study from 2015 from the University of Delaware says mascots with an environmental message do change peoples’ behavior. But it’s like a major guilt trip. And that’s exactly what Recycle Man does. He doles out high fives, shakes hands, whoops and hollers every time a recyclable makes it into one of the stadium’s blue bins. It’s also what Otto Klein hopes for with Ribby. At the bottom of the eighth inning, the Redband trout is back on the field, but keeping his distance. Ribby gives one last wave from far right field, kicks his fat red feet and streaks back through a hidden gate. Perhaps for a meeting with Recycle Man on a plan to keep cans and bottles out of his riverine habitat. 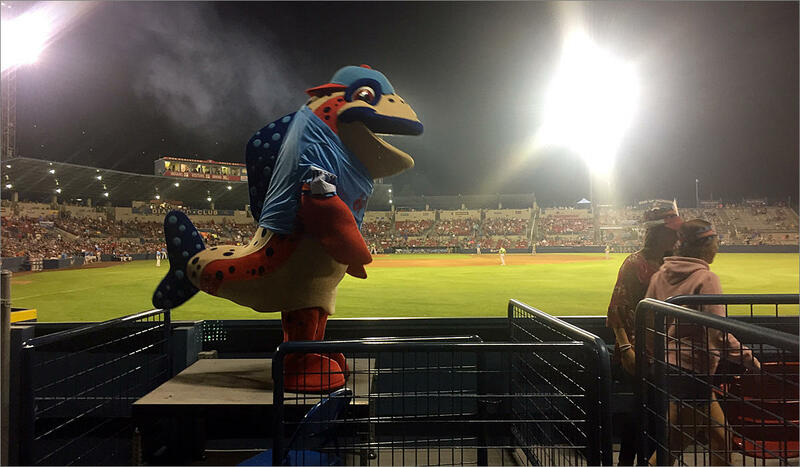 Unlike other sports mascots, Ribby the Redband trout keeps his distance from fans in part to make them aware of how best to treat fish in the wild.